North Kohala, Hawaii is a land of towering waterfalls and rich, impressive forests. 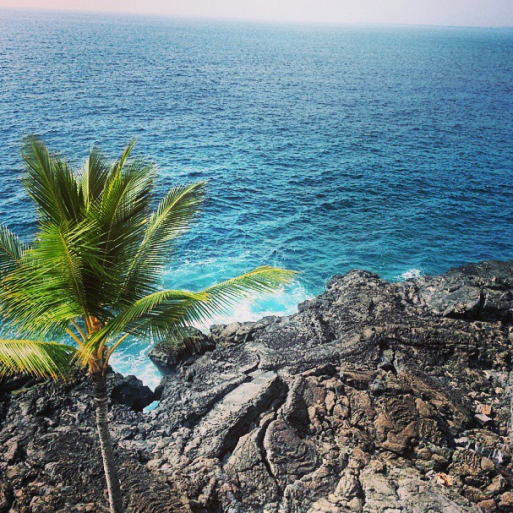 This was the backdrop to our Kohala Zip & Dip adventure with Hawaii Forest & Trail. We joined Mike Pickard, our guide, and four other guests on an exciting and educational adventure in the lands of Hawaii’s first king. We explored the vastly different lands, zipped high above the forest floor, picnicked on the rim of Pololu Volley, and swam under a private waterfall. I’m still in awe of my over-all experience with Hawaii Forest & Trail. The tour began with a beautiful drive of contrast and change from the dry-side resort area to the lush green country of Kolala. Along the way, we journeyed up the North Kona and Kohala coastlines over lava flows from Mauna Loa, Mauna Kea, and the Kohala Mountains. How do I know this? I asked tons of questions and I couldn’t stump our guide, Mike. He was an expert on the area, answering questions about geography, history, and culture as if he was a subject matter university professor. 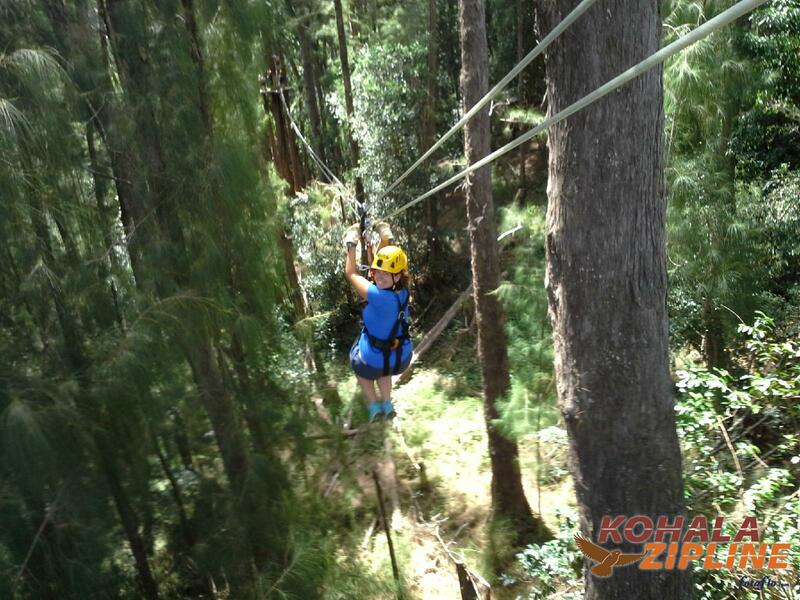 Past the quaint plantation town of Hawi, we arrived at our first stop – the Kohala Zipline Station. After gearing up and a safety orientation by the ACCT Certified Guides, we journeyed to King Kamehameha’s traditional family land holdings. In this area, known since ancient times as Halawa, elevated platforms are built directly into majestic trees to form a jungle-like course. 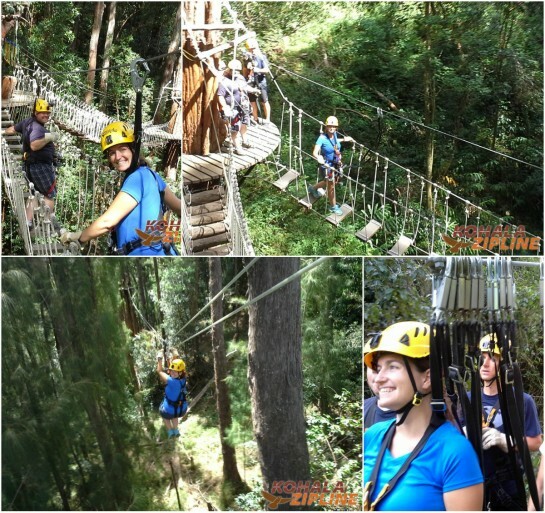 After two successful training zips, we traveled high up in the trees on 9 exciting ziplines and several suspension bridges. Flanked by an expert guide on either side, we always felt safe and prepared. We were offered such an elaborate spread before the last two zips that I assumed it was our lunch, but it was only a preparatory snack. At the end of the course, we rappelled from the final tree back onto solid ground. Leaving Halawa behind, we traveled to the “end of the road” at Pololu Valley before venturing through locked gates and heading into the mountains. 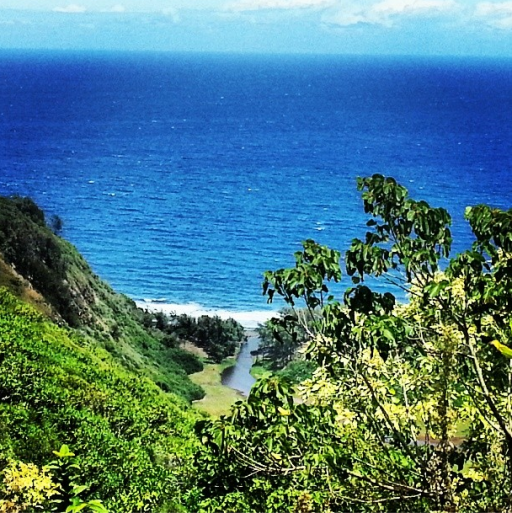 We enjoyed a delicious deli lunch of sandwiches, potato chips, and cookies, along with a choice of drinks, on a stunning cliff side site with unparalleled views of Pololu Valley below. Both Darren and I were shocked at the quality service provided by the guides. They remembered everything from silverware to garbage cans to remain eco-friendly, and their knowledge was like having personal encyclopedias on hand throughout the trip. Venturing deeper into the mountains, we arrived at our private trail site for a short hike. We continued further into the mountains for an unforgettable view then we took a dip in a mountain stream with cascading falls overhead. This was what I dreamed of Hawaii. 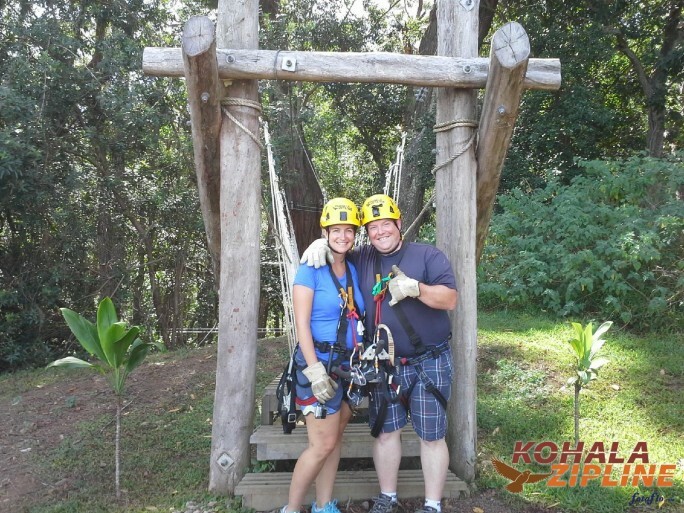 We returned to the Kohala Zipline Station to view photos and board our transport back to the the resort area. 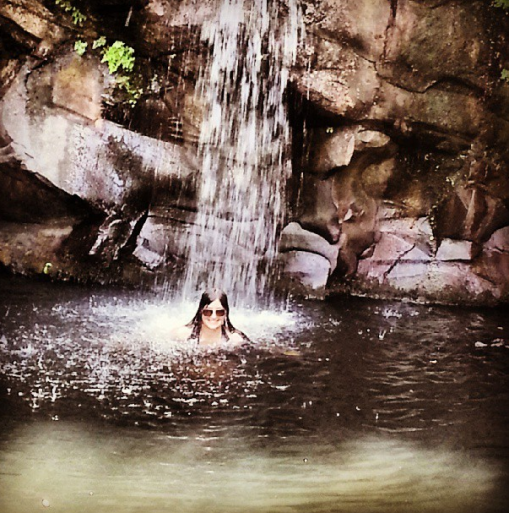 Under waterfalls, through the mountains, and over the trees sounds better than the song Somewhere Over the Rainbow. 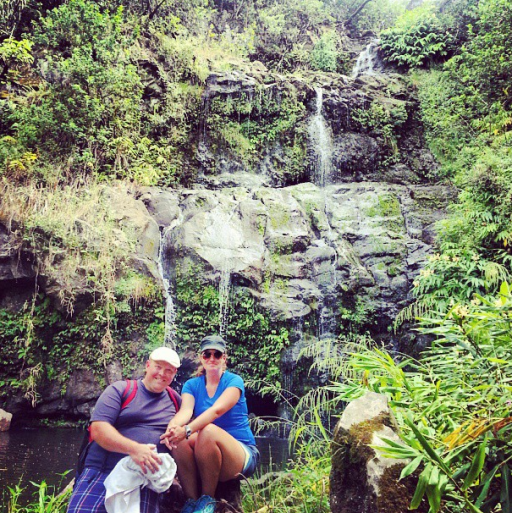 With stunning coastline panoramas, lush green valleys, and abundant water, the Kohala Zip & Dip is a truly memorable way to experience the very best Hawaii has to offer. I love Hawaii! It would be neat to live there! Looks like you guys had a grand time! !